I give this engaging novel 4.5 hearts! 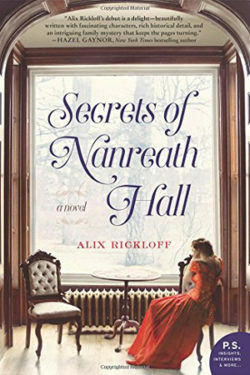 Alix Rickloff tells the story changing to alternating voices of mother and daughter for each chapter. The mother, Lady Katherine Trenowyth, rebels against her parents and leaves Trenowyth Hall, on the rocky cliffs of Cornwall, for London in 1923. Her parents disown her. Lady Katherine’s lover, bohemian artist Simon Halliday, is her daughter Anna’s biological father. Lady Katherine dies when Anna is six and her father dies in WWI. Anna’s adoptive parents die in a bombing raid in 1940, during WWII, before telling Anna about her Mom. After being injured at Dunkirk, and losing her beloved, adoptive parents Nurse Anna is reassigned to Nanreath Hall. Nanreath Hall has been made into a makeshift military hospital. Even among the sadness and tragedy of war, Anna finds there is friendship and love. This was the ancestral home her mother had left twenty years ago. Anna meets a cousin, Lord of the manor, Hugh, injured in the war. Hugh’s mother, Lady Boxely, rejects Anna when she first arrives for reasons unknown to Anna. Hugh helps Anna discover secrets of the past, and she must make a decision if those secrets are too dangerous to unearth. The characters are expertly drawn in the time frame in which they lived. Anna’s two roomies at Nanreath hall are also Red Cross Nurses. Their sub plots are woven through out. This story is fast paced and a real page turner. I highly recommend this SECRETS OF NANREATH HALL. The author’s vivid descriptions puts the reader right in the story.